Understanding that a global humanities course is taught in varying ways, Gloria Fiero redefines the discipline for greater flexibility with the 7th Edition of The Humanistic Tradition. Enhanced by McGraw-Hill’s LearnSmart® and SmartBook®, Fiero delivers a learning experience tailored to the needs of each institution, instructor, and student. With the ability to incorporate new extended readings, streaming music, and artwork, The Humanistic Tradition renews the understanding of the relationship between world cultures and humankind’s creative legacy. McGraw-Hill Connect Humanities is the only integrated learning system that empowers students by continuously adapting to deliver precisely what they need, when they need it, so that your class time is more engaging and effective. It provides tools that make assessment easier, learning more engaging, and studying more efficient. McGraw-Hill Connect® Humanities is now powered by McGraw-Hill LearnSmart®, an adaptive learning program designed to personalize the learning experience. LearnSmart is proven to help students learn faster, study smarter, and retain more knowledge for greater success. By helping students master core concepts at their own pace, LearnSmart enables instructors to spend more meaningful time in the classroom. Fueled by McGraw-Hill LearnSmart®, SmartBook® is the first and only adaptive reading experience, designed to change the way students read and learn. SmartBook for Gloria Fiero's The Humanistic Tradition creates a personalized reading experience by highlighting the most impactful concepts a student needs to learn at that moment in time. This ensures that every minute spent with SmartBook is returned to the student as the most valuable minute possible. No two humanities courses are the same. That is why Gloria Fiero personally selected more than 150 additional readings, which may be easily added to The Humanistic Tradition in McGraw-Hill Create®. Marginal icons appear throughout the 7th edition to indicate the relevant additional readings. The first and only analytics tool of its kind, McGraw-Hill Connect® Insight is a series of visual data displays, each framed by an intuitive question, providing at-a-glance information on your class. Intuitive: Receive an instant, at-a-glance view of student performance matched with student activity. Dynamic: Connect Insight puts real-time analytics in your hands, so you can take action early and keep struggling students from falling behind. Mobile: Connect Insight travels from office to classroom, available on demand wherever and whenever it’s needed. 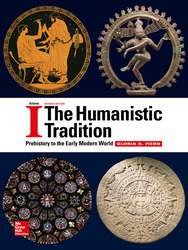 The 7th Edition of The Humanistic Tradition includes a new chapter feature, Looking Into, providing diagrammatic analysis of key works, such as Neolithic Stone Circles (including the latest archeological discoveries in Southeast Turkey), the Parthenon, the sonnets of Petrarch and Donne, Shiva: Lord of the Dance, Jan van Eyck's Arnolfini Double Portrait, and Judy Chicago's Dinner Party. The 7th Edition of The Humanistic Tradition places further emphasis on critical thinking by expanding upon two popular features: Exploring Issues and Making Connections. To Exploring Issues, the debate over the origins of India's Vedic culture (chapter 3) was added. To Making Connections, Fiero offers a novel illustration of the contemporary affection for Chinese landscape painting (chapter 14). Additions to the 7th Edition art program include the Nebra Sky Disk, Hellenistic mosaics, Delacroix's Women of Algiers, Oceania's art of tattoo, Japan's Amida Buddha, Charles Willson Peale's Portrait of Yarrow Mamout (the earliest known portrait of a Muslim in America), Ai Wei Wei's Forever Bicycle, Ernesto Neto's Anthropodina, and Zaha Hadid's Heydar Aliyev Center. Chapters 37 and 38, which treat the Information Age and Globalism, have been updated to present a cogent overview of contemporary issues, including terrorism, ecological concerns, ethnic conflict, and the digital arts. McGraw-Hill Connect® Image Bank is an instructor database of images from select McGraw-Hill Education art and humanities titles, including The Humanistic Tradition. It includes all images for which McGraw-Hill has secured electronic permissions. With Connect Image Bank, instructors can access a text’s images by browsing its chapters, style/period, medium, and culture, or by searching with key terms. Images can be easily downloaded for use in presentations and in PowerPoints. The download includes a text file with image captions and information. Connect Image Bank is accessed via the library tab in Connect Humanities. To assist students in achieving global cultural literacy, The Humanistic Tradition is manageable in size without sacrificing coverage. Its organizational framework adheres to a chronological structure, while retaining a topical approach to studying the arts and ideas by way of clearly defined themes, movements, and styles that dominate the time periods. To stimulate critical thinking and classroom discussion, the Exploring Issues feature focuses on controversial ideas and current debates, while Making Connections brings attention to contrasts and continuities between past and present. New and revised content appears throughout the text, reinforcing Gloria Fiero's commitment to timely and relevant issues, while exposing students to the latest scholarship. A complete set of instructor resources are available for The Humanistic Tradition. These include an instructor’s manual with discussion suggestions and study questions, music listening guides, lecture PowerPoints, and a test bank. Gloria Konig Fiero was born and raised in New York City. She earned her Masters degree in Art History at the University of California, Berkeley, and her Ph.D. in Interdisciplinary Humanities at the Florida State University. She has taught Humanities, World History, and Art History for more than twenty-five years. She has written and lectured extensively on medieval and renaissance topics and on the arts of both East and West as they reflect the human condition. She currently divides her time between New Orleans, Louisiana, and New York City.